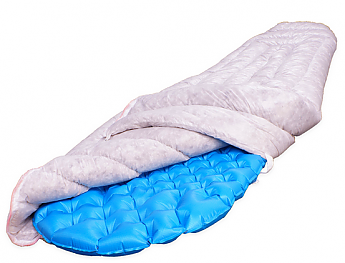 If you're looking for a quilt that won't break the bank and you don't expect cold temperatures (sub 40° F / 5° C ), this Aegismax Wind Hard quilt is an excellent choice. The Aegismax Wind Hard quilt has been in my sights for awhile. I finally picked one up and was able to get out on a multi-day backpacking trip in some perfect weather to put this quilt to the test. The company rates the quilt at 0° - 5° Celsius (32° - 41° F) and my personal experience matches this assessment fairly close. 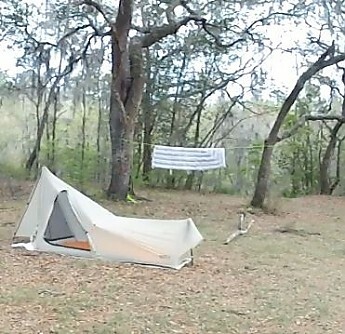 As luck would have it, I had a hiking partner trying this quilt for the first time on this trip as well —Double review! I should note that I used the quilt in conjunction with my Klymit Static V Lite which has a pretty good R-Value (4.4) for a sleeping pad. I also had on a knitted beanie, a set of long sleeve/leg synthetic base layers, and a synthetic pullover shirt. The second night was similar, except it only got down to 40°F so I stayed "in" the quilt (over my head) but got more sleep since it didn't drop into the 30s. My hiking partner reported the same level of wakefulness/comfort at these temperatures. We both recommend this quilt at 50°F (10° C) or up for comfort. 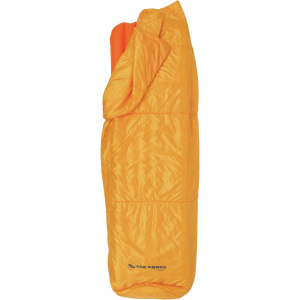 You can be comfortable down to maybe 45°F if you tuck yourself completely inside the quilt (bring your head inside it and cinch the draw cord down so that have room to breathe, but are under the quilt). I am 5' 8" and about 160lbs and my hiking partner is 5' 6" and 230lbs—both of us were pleased with the amount of space the quilt offered including the foot room. I could see where someone over 6' might be lacking a little, mostly if that person needed to get completely inside the quilt. Getting in and out of the quilt seemed no more difficult than any other quilt. 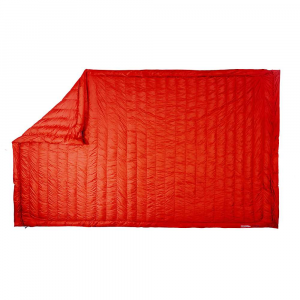 I was using a small, single wall tent which does have the typical condensation issues and didn't have any issues with that moisture affecting my quilt. I did notice it seemed to have a little moisture in the stuff sack the next night so i dried it for a short time (30min-1hr) but the loft never went down due to moisture penetration. I also "wore" the quilt in camp a bit and spilled a little coffee on it... it didn't penetrate and I was able to swipe away most of the liquid without it affecting the quilt. 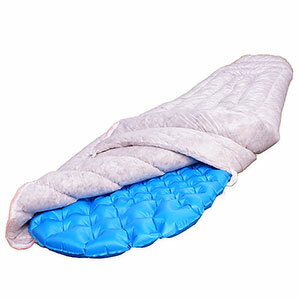 The Wind Hard quilt comes with a compression bag that is easy to use and effective. It packs down small. Also included is a hang bag to store the quilt; It's large enough so that the down doesn't compress, but you can hang the quilt in your closet (or wherever) without having to drape it at full length. For sleeping, I found the quilt easy to use. You can zip/unzip the foot box area and cinch the bungie down to enclose it or leave it open for more air circulation. You can also strap it under the pad so it doesn't slide off. I used those straps and it stayed in place, nicely. The company sort of markets that you can "wear" the quilt around camp: This was not so "easy". 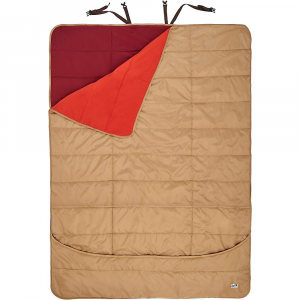 They have made a special zippered area in the middle of the quilt for un-zipping so you can slip this quilt over your head. 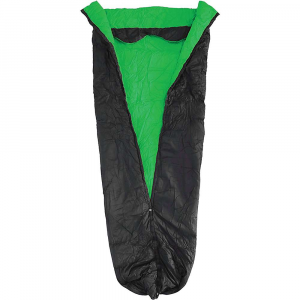 Utilizing this zipper and the same straps you would use to keep it from sliding off your mat, you are supposed to be able to "wear" it rather than just wrap up in it like a blanket. There are NO INSTRUCTIONS for this and it's a little awkward. I had the most success by putting my head through the zippered area in the middle then bringing the portion of the quilt behind me around the front of my body and buttoning one of the straps. This kept the back from swinging around and insulated my back. I left the quilt on the front of my body hanging freely. I must confess I am writing this review after only 25 miles worth of backpacking, so long term durability isn't something I can vouch for at this point. The sewing and construction seems to be solid. If anything breaks, I would bet that one of the straps might be the first to go from wear and tear (I doubt it will pull out at the stitching; the strap material just looks like it can wear/rot the easiest). 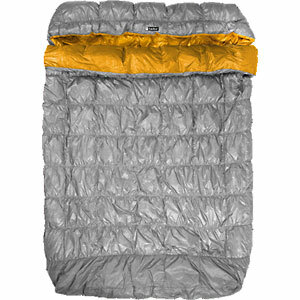 This brings us back to affordability, though... will it wear out so fast that you might opt for a quilt like an Enlightened Equipment Revelation at more than double the cost? Probably not. Great review, Joshua! Thanks for taking the time to share it. 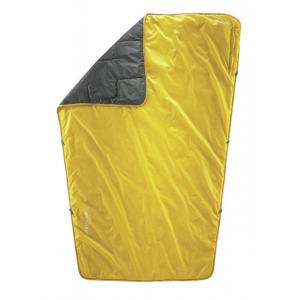 The Aegismax Wind Hard Quilt is not available from the stores we monitor.